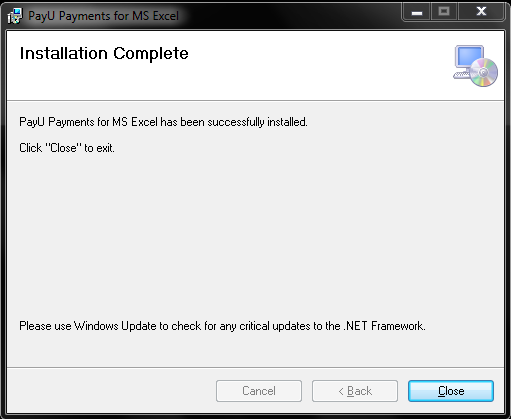 You need to have .Net framework 4.5 or above & MS Visual Studio 2010 installed in your system to be able to use the plugin. You can check that in the Control Panel. 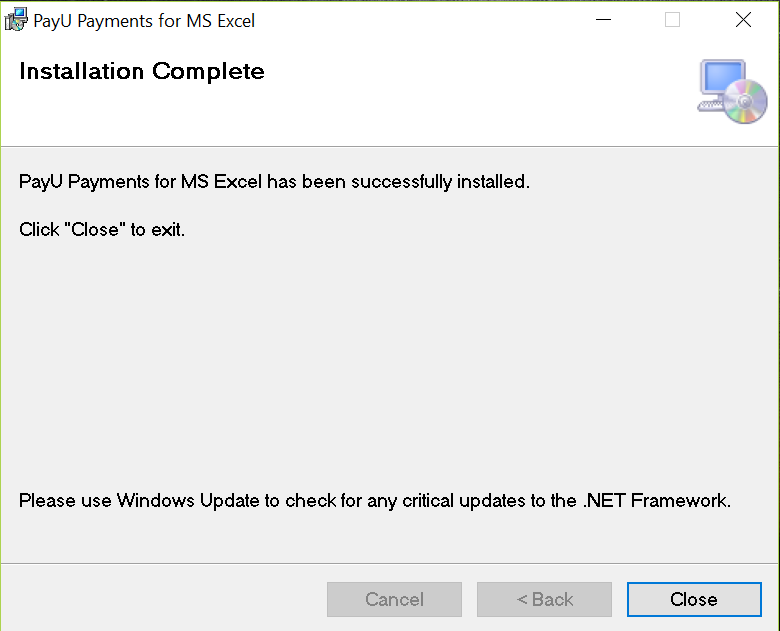 If you don’t have .NET framework 4.5 or above then you can either install from this link or the one just above the download button. You will get redirected to the Microsoft Page from where you can download the .NET framework. 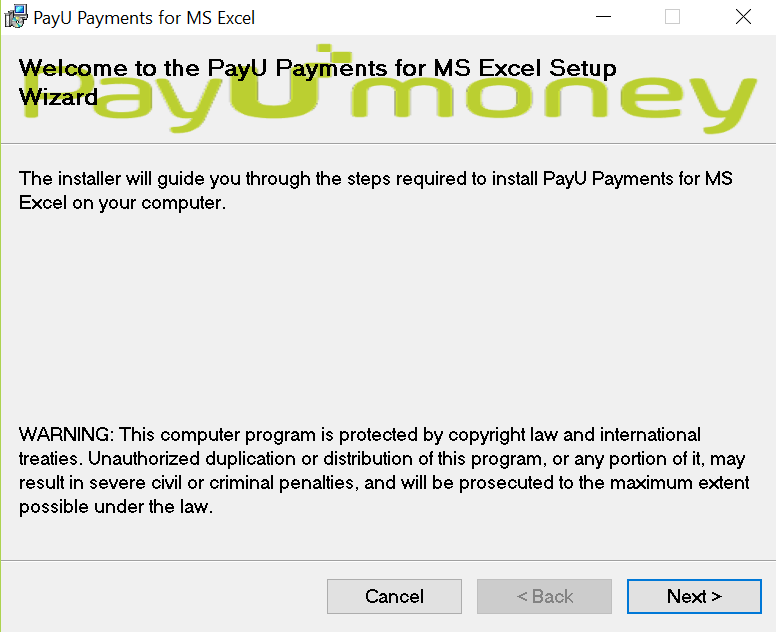 Click on Download and install it just like any other software. 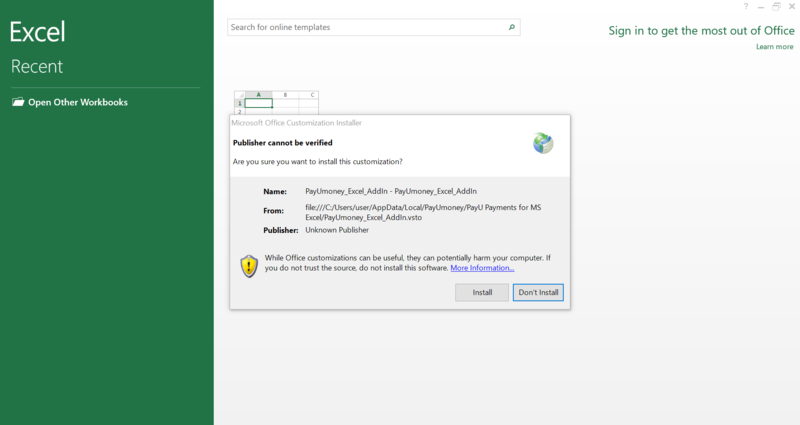 Similarly, If you don’t have MS Visual Studio, 2010 Tools for Office Runtime, you can either install from this link or the one mentioned just above the download button. 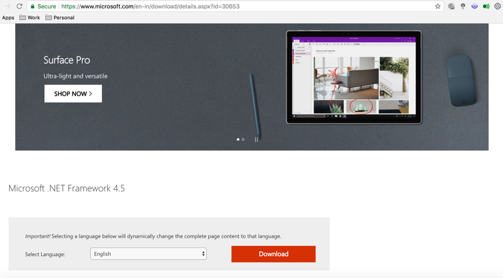 You will get redirected to the Microsoft Page from where you can download the MS Visual Studio 2010. Click on Download and install it just like any other software. 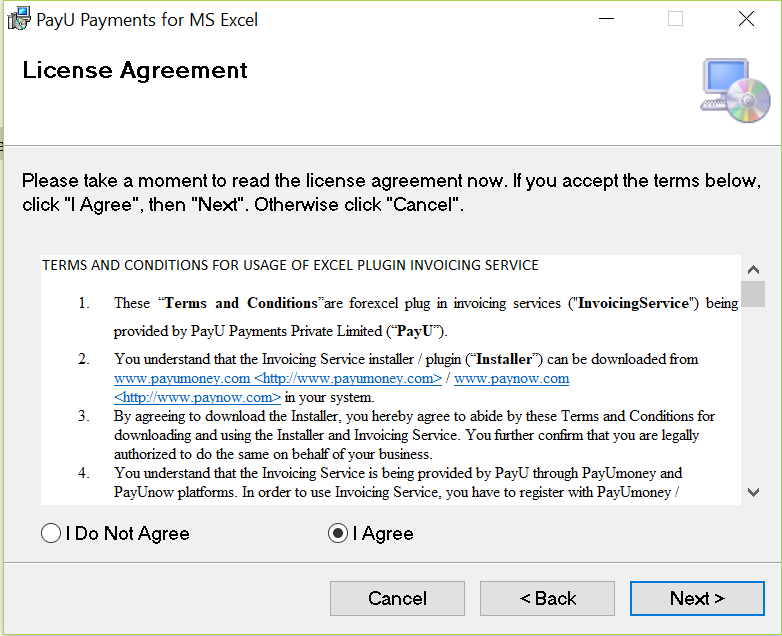 Select ‘I agree’ for the Terms & Conditions and then press Next. 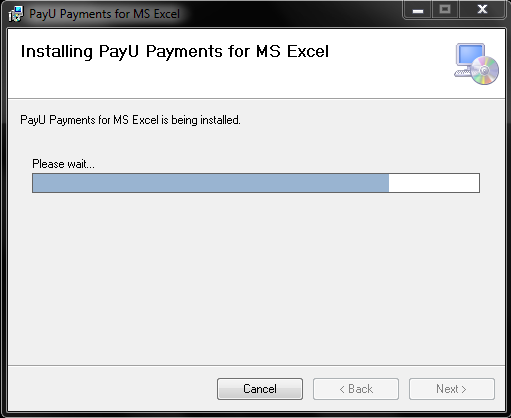 The installation progress bar appears. 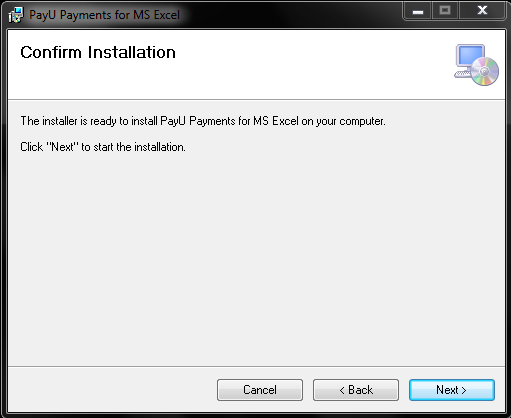 Wait for a couple of seconds and the system will show a pop asking whether you want to install the plugin. The plugin will get installed in a couple of seconds. 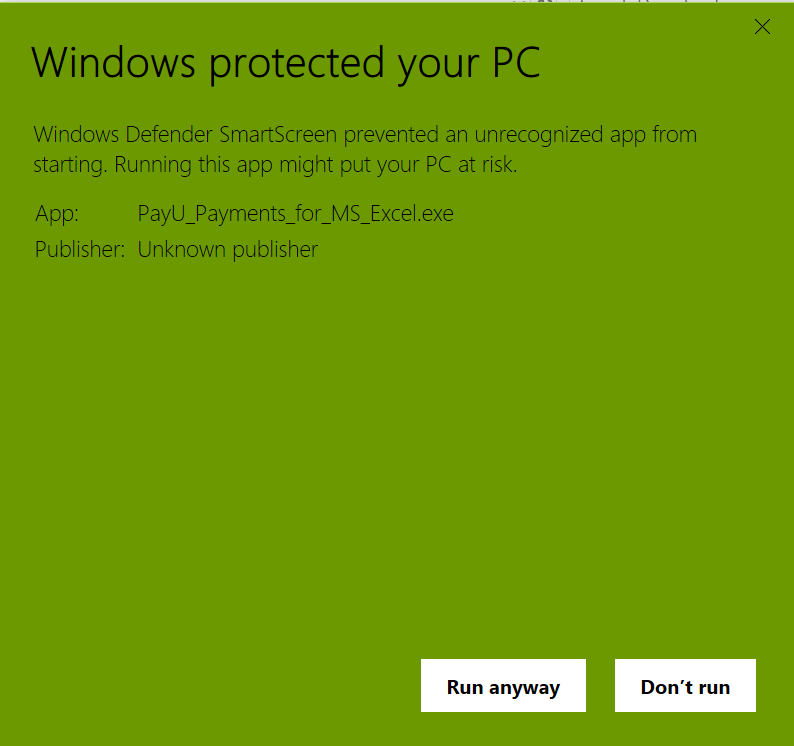 If you have Windows 8, 8.1 or 10 system, you don’t need to check whether the per-requisite software are installed or not. Here, we are using Windows 10 as this is widely used and is the latest OS. 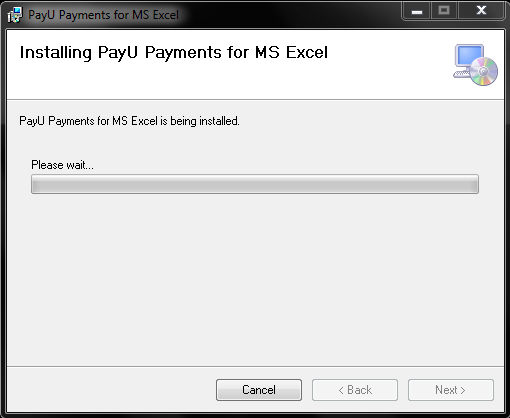 Click on Download the smart Plugin for Windows 8 & above button to download a file named PayU Payments for MS Excel.exe. You will be asked whether you want to save the file. Click Save. 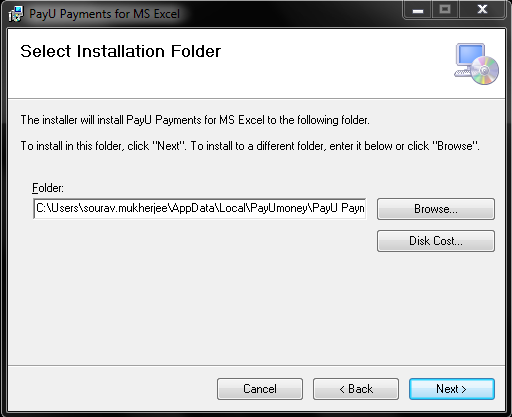 If the system does not have a per-requisite, the set up auto-detects it, downloads and install it. 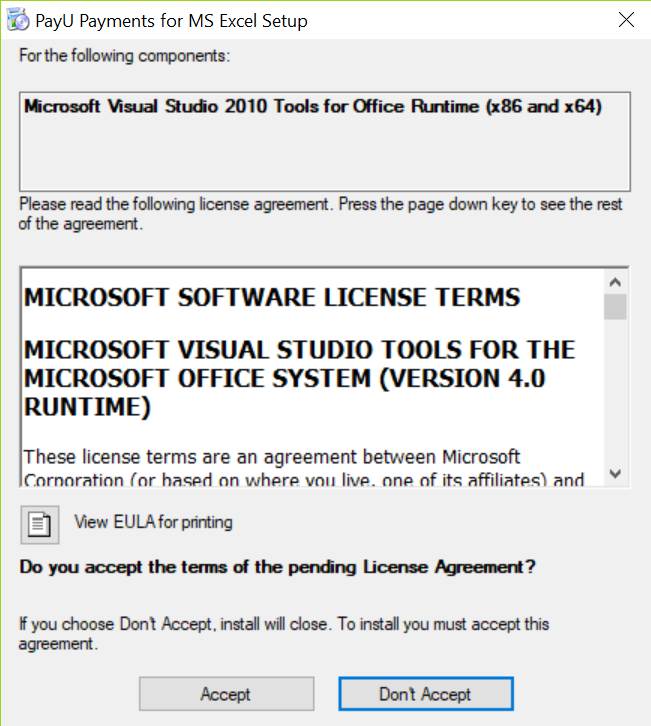 Here, it is detected that the MS Visual Studio 2010 Tools for Office Runtime is not installed. 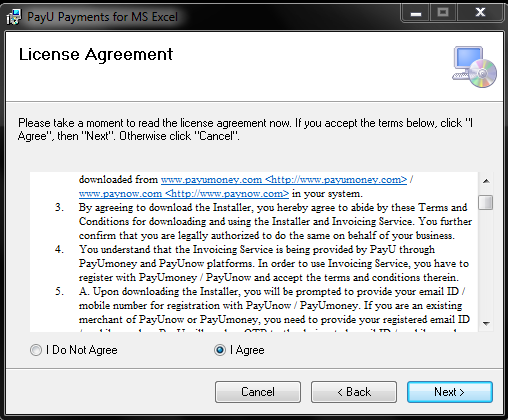 Thus, the set up asks for accepting the license agreement for the requirement. Click on Accept. The set up starts downloading it. Do not press Cancel here. 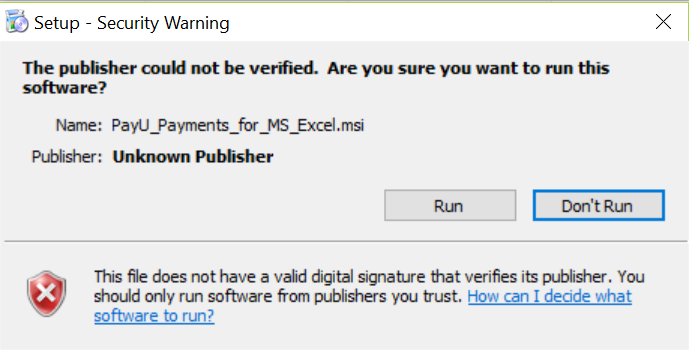 Once the per-requisite is downloaded, the system asks for the permission to install it. Click Yes. 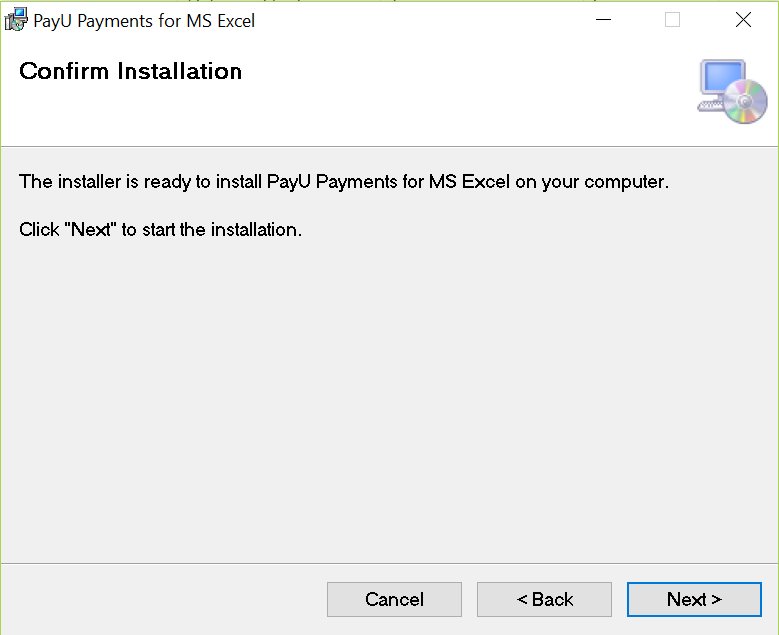 The installation process starts and the per-requisites are installed. 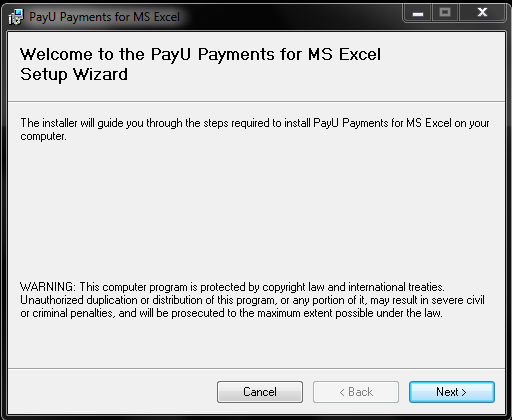 Once completed, the Windows asks for permission to install the plugin. Click Run and its starts to the plugin installation process. Vola! The installation is complete. 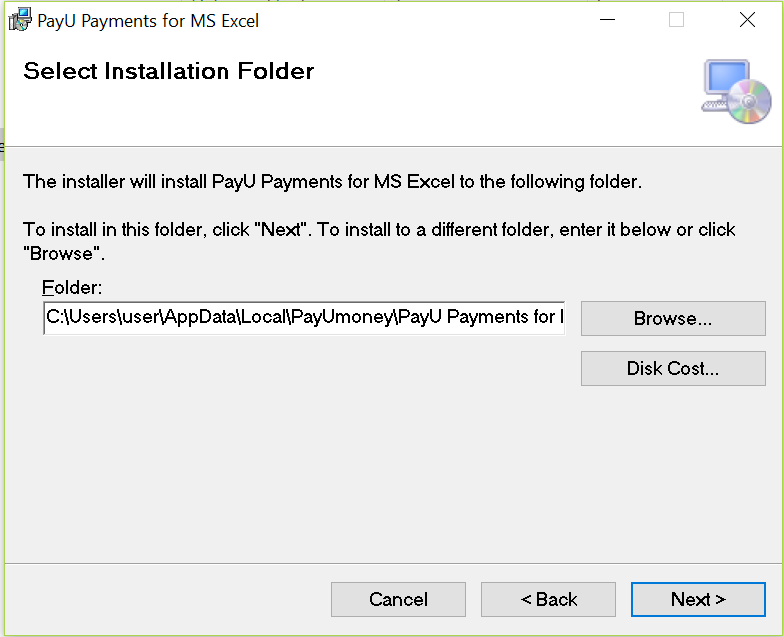 You can open a New Excel Sheet & start using the plugin for payment collection. 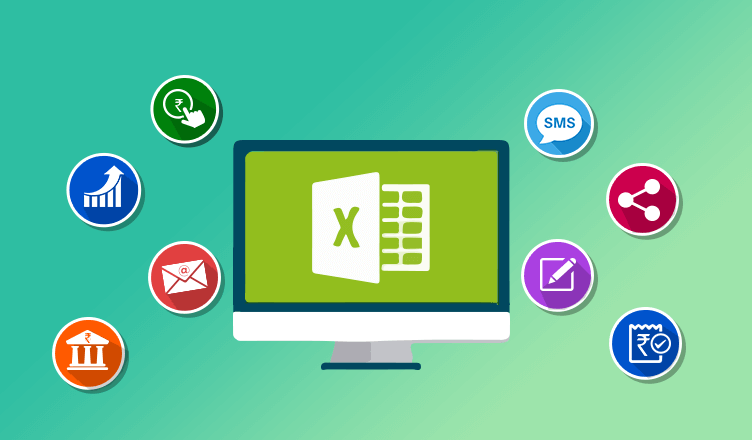 Note: If you have MS Excel 2013 or 2016; You will be asked to install the add-in inside the Excel. Click install. 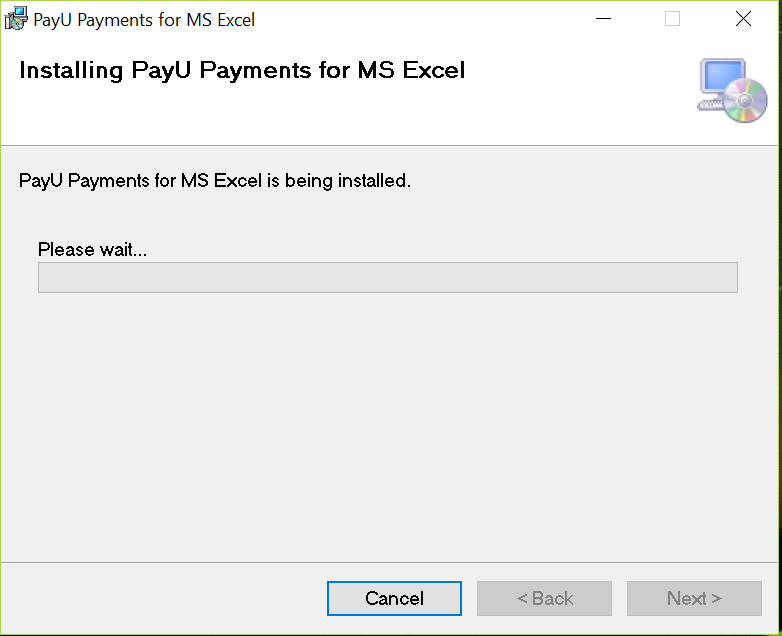 Now that you how to install the plugin, learn how to use PayU Plugin for MS Excel here. 9 Simple Tips On How To Improve Cash Flow For Businesses!